Perhaps not many Koreans are aware of the German company "Korea Illies Engineering" which mother company, C. ILLIES & Co., was founded in 1859 in Japan, by a German merchant, but the Hamburg-based German company opened its South Korean office in 1957 in actuality. "Back then we imported and sold various machines to the Korean industry, textile machines were hot selling items in the past, as South Korea just started industrialization," said it’s CEO Michael Hennig, who has been serving as its president for the last nine consecutive years. "Our presence in Asia was and is very strong," President Hennig said. "The enormous growth potential and the ‘can do mentality’ of Asians is one of the driving forces of our strong presence"
CEO & President Michael Hennig of Korea Illies Engineering talks with a journalist from The Seoul Times during the interview he had in his office on June 11, 2012. He added that many other international companies are attracted by this Asian attitudes and values. "I am very satisfied with my Korean colleagues," he said. "They are not only hard working but also highly efficient"
President Hennig is now in charge of 27 Korean men and women working for him in his office in Jangchung-dong, Seoul. He said he spent 10 years in Hong Kong, went back for three years to Germany afterwards and was then transferred to Seoul. "Many global companies do not seem to know the merits and attractions of doing business in South Korea until they come here," President Hennig said. "The South Korean market is still undervalued in my opinion"
The 52-year-old German CEO has spent over 22 years in East Asia, representing a German company. The Seoul Times has recently met with him to inquire how he likes serving in Korea and to find more about his company. The following are the questions and answers. Q1: Thank you very much Mr. Michael Hennig for this opportunity. When did you take charge as the president of Illies Korea? And how does it feel to lead a German multi-national corporation in another country? 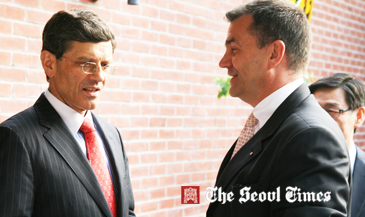 CEO Michael Hennig (right) of Korea Illies Engineering talks with German Ambassador to Seoul Hans-Ulrich Seidt during a diplomatic reception recently held at the envoy's residence. A1: I came in June 2003 to Korea and took over the responsibility from my predecessor mid of June 2003. Before I came to Korea, I was heading the operation of a German machine manufacturer and was based for 10 years in Hong Kong and China. Q2: What is the vision and motto of Illies Engineering Co.? It has been an impressive journey for the last 150 years. Where does Illies Engineering see itself in next 25 years? A2: We opened our office in Seoul in 1957. Our motto was and is “connecting markets since 1859” We see ourselves still as a reliable partner for our business associates, and are therefore always interested to establish a long lasting trustful business relationship. Q3: What separates your company from your competitors? Can you tell us your strategies to stay competitive and innovative over your competitors? A3: Our philosophy is not to talk about our competitors. Everybody (also the competitor) is trying to do the job as good as possible. Trading is all about trust and reliability. We think long term. Most of our employees are working since a very long time for us. One director will reach 40 years with us within soon. Certainly we do employ young engineers all the time as well, but it is our aim to keep them for a long time as well. Q4: Why has Illies Engineering Company limited itself to largely in Asia and China? Why haven’t you ventured into North American and African markets? A4: As the company was founded in 1859 in Japan, the founding family had always a strong affection to the region and we just developed it further. Later on the Headquarter moved to Hamburg, Germany. However we had for several years offices in Africa and America, but we decided to focus to the East and Far East region. We always say: everything East from Hamburg is OK.
Q5: What brought you to Korea Illies Engineering Co.? What are your hopes for the Korean market? Are there any strategies to be unveiled to expand your base in Korean market? A5: I know the company ILLIES since 1985, when I finished the university and started my business life. From the very beginning I was connected to ILLIES, since my previous company had several business relations with ILLIES as a partner. My first business trip (1985) took me to China. In 2000 we returned to Germany and got the offer from ILLIES in 2003 to take over their Korean operation. Since I knew Korea from a lot of business trips and I knew ILLIES very well, I thought it is a perfect match. 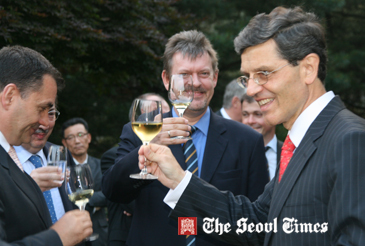 CEO Michael Hennig (left) of Korea Illies Engineering is making a toast with German Ambassador to Seoul Hans-Ulrich Seidt (right) during a reception recently held at the envoy's residence. Korea is and will be one of our main markets. We still see great opportunities in Korea. Korea did develop so fast and we have to keep the pace to provide our added value, which I believe we are able to do. Q6: What are your management styles or philosophies of managing your employees and company? A6: My style is simple: Trust, reliability, appreciation, straight forward, no 2nd agenda. I believe that is what everybody is looking for. If you are willing to give this first, you will not be disappointed with the feed-back respectively the return. I’m now in business for 27 years and I did it always like that. The disappointments I received so far are almost none, but the return was excellent during all that time. Q7: I think that this question is very important for the young folks graduating from colleges. How do you recruit best qualified employees? What kind of employees do you need to hire? A7: We do need bright, honest, reliable quick thinker, which have a good technical understanding. To be honest: I appreciate that education has a strong focus in the Korean society; however, grades are not everything. In my opinion Korean society has a little bit too much focus on the grades and certificates and such thing. I had people in my office who had, for example, very high points in the TOEIC/TOEFL English test and where unable to communicate. Don’t get me wrong: grades are important, but they are not my top priority. I judge the applicants by their impression they do on us in the interview and the personal discussions. 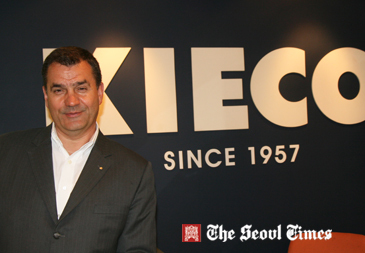 Q8: Illies Korea Engineering Co. opened its Korean office in 1957. How has the journey been so far? How would you assess the current stature of your company? A8: The journey was good. In the early years our task was to introduce machines from “far away” to Korea. In the global world nowadays, the customers know already a lot and they do not need us just for the introduction anymore. Now our job is more to figure out exactly what is in need and search for the right machine maker to satisfy the customer. Not to forget the After Sales Service. Without Service (which we have) you cannot sell anymore. It is necessary to be deep in the technology. You need to transfer from a normal “agent” to a reliable business partner with an added value; otherwise nobody is willing to pay you. Q9: Apart from running Korea Illies, you are busy with your other duties. You are an active member of Board of Korean German Chamber of Commerce and you were the chairman of the Board of German School in Seoul for a very long time. You are also honorary citizen of Seoul. Can you tell us about your role in these positions? 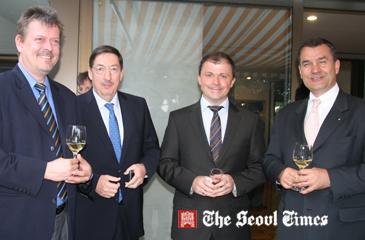 CEO Michael Hennig (right) of Korea Illies Engineering poses with others during a reception held at German envoy's residence. A9: The German School is a very important institution for German families going abroad, as well as for Korean families, who have lived in Germany for a while and would like to continue with the German School system after their return. I became a board member of the German School in 2003 and shortly after that I became the Chairman, working as such until summer 2010. I feel it is the responsibility of everybody to involve in things, which you deem important. Since all the board members and members of the parent teacher association work voluntary, your capacity doing such work is limited. So I decided to give my chair to a successor. I became honorary citizen of Seoul in 2008 as an appreciation for my work in the German School. The Korean German Chamber of Commerce and Industry (KGCCI) is another very important organization in between Korea and Germany, focusing on the very important business relation of both countries. I’m a board member for almost eight years and I’m trying to bring as much input as possible, to support the Korean German business community. Q10: Do you find some free time to enjoy yourself? What are your hobbies? And how do you keep both your mind and body in shape? A10: It is important to have time for yourself and to unwind from business, get a clear mind. Important in my opinion is that you have the strong hold of your family, which I have. Sport is a very good thing to relax, here I have to improve. My hobbies are in the field of cars and motorbikes. Building engines modify the existing and so on. That’s where I can totally relax. Here in Korea I have a small workshop in our house and I do work on one motorbike. During the weekend I enjoy to take it to the outskirts of Seoul, but somehow I spend more time working on it than riding it. Illies Engineering Co. was founded in 1859 in Japan by a German merchant. The company has since then made its presence in other regions of the world. It has some 450 employees’ worldwide with a well known tradition that employees work for the company for very long period of time. Illies Engineering Co. strives for long-term business relationships specialized in different sectors. It has moved from a trading firm to an engineering company. Its areas of business also include engineering and plant business, agro-industrial and food processing, training and technical consulting of customer’s operators, consumables for the textile industry, supply of spare parts, and tailor-made machines for special applications. Korea Illies Engineering Co. was established in 1957 as the war-torn South Korea was fast industrialized and it needed equipments and technologies from the industrial countries including Germany. The growth of Korea Illies was driven by the fact that South Korea’s economic upturn in the late 1950s and she depended largely on the textile industry in its early stage of industrialization. Her export-driven economy focused on textile machinery. The company’s operations in Korea include the import of textile machines, tooling machines, chemical plants, photovoltaic machines, and paper converting machines. South Korea’s fast economic development contributed to the rapid growth and strength of Korea Illies. President Michael Hennig of Korea Illies singled out the honesty and hard working values of Koreans, security, and a good legal system as paramount to the company’s continuous growth and innovation. For details or inquiries call the office "Korea Illies Engineering" at 2276-0501.